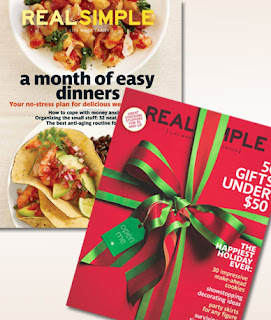 $10.80 for Real Simple Magazine 1-year Subscription! $60 Value! Head on over to Mamasource to score a 1-year subscription to Real Simple magazine for as low as $10.80! This has a cover price of $60, saving you over 80%! The deal is on sale for $12, but if this is your first Mamasource purchase, use the code DEC10 at checkout to save 10%, making it only $10.80!